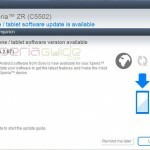 In starting of September we posted that a new android 4.2.2 10.3.1.A.2.67 Firmware is in testing and soon it may come and yesterday Sony Mobile tweeted that a firmware is about to roll on whole Xperia Z family including Xperia Z, ZL, ZR and Tablet Z. 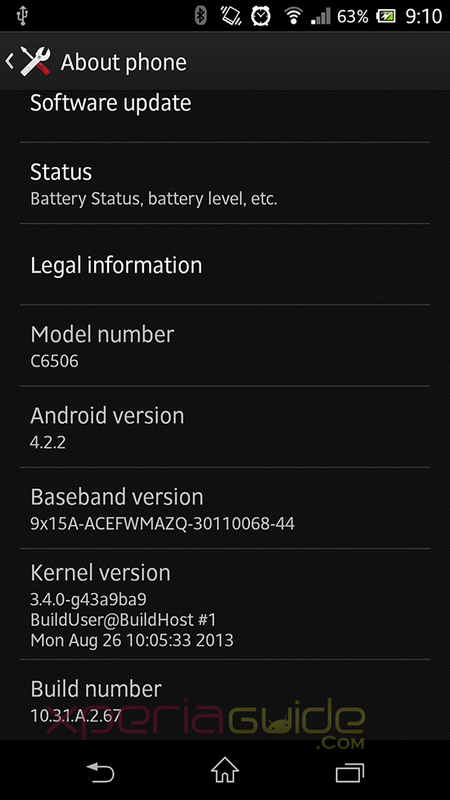 A few days back on Xperia ZR 10.3.1.A.2.67 Firmware update rolled out and seems a minor bug fixing update only. 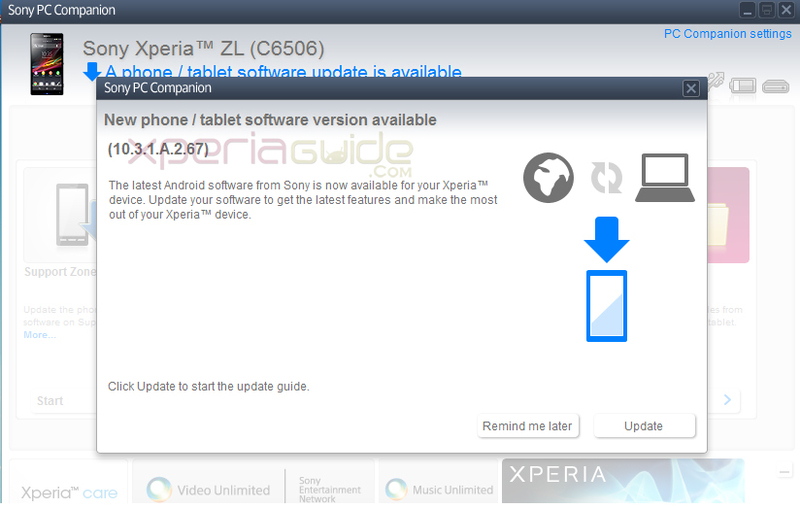 Just now we have spotted that Xperia ZL has also got the same 10.3.1.A.2.67 Firmware update. 10.3.1.A.2.67 Firmware update keeps Xperia ZL on Android 4.2.2 only and is confirmed rolling on C6506 ( LTE North America version ) and C6503 ( LTE Europe / Asia version ) of handset. 10.3.1.A.2.67 Firmware Update confirmed in USA, Germany, Ukraine, Singapore, Saudi Arabia , Philippines and available via PC Companion / SUS / Bridge. 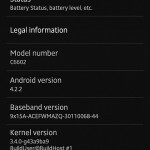 Connect your Xperia ZL to PC and check for 10.3.1.A.2.67 Firmware notification just like below on PCC and proceed as per on screen instructions. 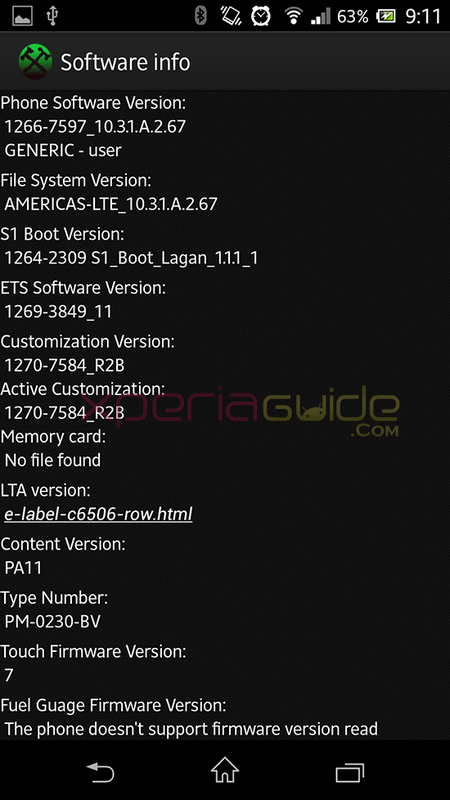 Software info of 10.3.1.A.2.67 Firmware added below. If you have not got 10.3.1.A.2.67 firmware update yet, we will soon update the 10.3.1.A.2.67 ftf links here. 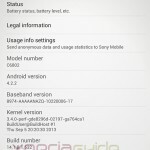 10.3.1.A.2.67 update is a minor update over previous 10.3.1.A.0.244 firmware but as per Sony Mobile tweet, the changelog of 10.3.1.A.2.67 firmware update includes display, camera, battery fixes & performance tweaks. 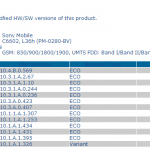 If you have updated your Xperia ZL on 10.3.1.A.2.67 firmware, then let us know did you find any noticeable change in this new 10.3.1.A.2.67 firmware update. Drop your comments. Successfully updated at second attempt. Haven’t noticed any changes, other than confirmation in the Build number. Would welcome any improvements, and look forward to the changelog. Having only owned my C6503 for six weeks, I am impressed that this is the second update. 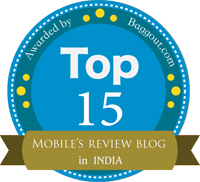 Keep up the good work Sony Mobile!! Battery bug when powering up the ZL is fixed. Before the update it would inaccurately increase the battery level percentage by up to 30% when powered up from a partially discharged state. Now the battery level percentage in the status bar is accurate after powering up the ZL. Update confirmed on PC now from Tunisia great job Sony thx ! !